Students and local Indigenous and knowledge keepers collaborated on an extensive mural project to showcase Indigenous culture and traditions. 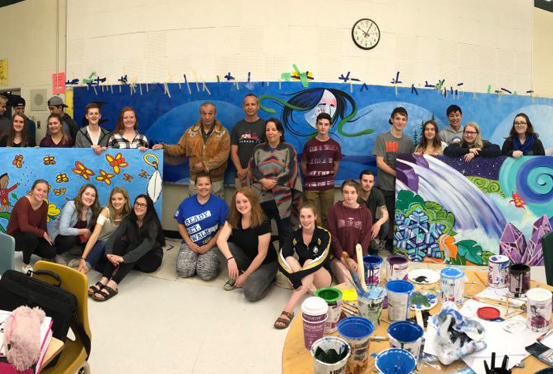 Ensuring all students can see themselves reflected in their surroundings was the seed that planted the idea for an extensive mural project celebrating Indigenous tradition and culture at Napanee District Secondary School. Students in the school’s native studies program spent several weeks learning from and working alongside local Indigenous artists and knowledge keepers to create a series of murals that now hang in the school library. Each mural, consisting of three panels and measuring 24 feet in length, tells a story of Indigenous history, culture, and legends. The hope is that bringing Indigenous and non-Indigenous people together will help bridge the gap between generations and cultures. “This project challenged us to be able to see how we could handle the path of reconciliation within our school from a youth action standpoint,” says native studies teacher Karen Ranall Blancher. The “Honouring Our Land” project was made possible thanks to grants and support from the Board, Limestone Learning Foundation, Ministry of Education, Napanee Community Foundation and the Napanee Alumni Association.